Hello from Oregon from Misha, Sharon's fur folk! 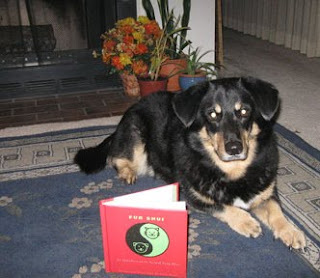 This is what Sharon had to say about Fur Shui: "My dog Misha, a corgi/daschund mix, and I live in Portland Oregon. It is the end of October and the weather is cooling down. Misha is parked before the fireplace in anticipation of a warm hearth to snuggle up with a good book. 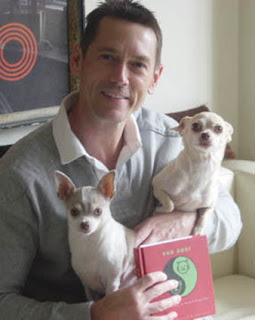 Nothing like strong supporative fire chi to complement Misha's Fur Shui fame sector!" Both Misha and Sharon know the power of the Fire Gua. Thanks for being part of the Tour! The Wild Wild West Tour de Fur continues with Rainy's visit to the Mammoth Site in Hot Springs So Dakota. The West was certainly inhabited by some pretty HUGE fur folks way back when...just look at how small Fur Shui looks in with the hip bones of these critters! A neat actual dig and Rainy says: " The pics were taken in a replica mammoth bone structure. This is an active dig site. SO AWESOME." 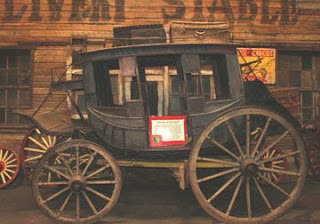 Go to: http://www.mammothsite.com/exhibits.html for a look! Fur Shui and Rainy "get down" into the earth and go into the beautiful Mt. Rushmore Caves...her tour leader showed some rare stalagmites and formations to all. Read what Rainy had to say: "These pics are in the Mount Rushmore Cave. Frank our guide thought that it was great that Fur Shui was on vacation. He even went off the normal tour path so that Fur Shui could be photographed near some of the stalagmites and the longest column in any cave of So. Dakota. 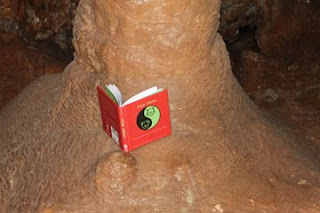 There is a pic with an arm holding the book near a very RARE cave coral formation. 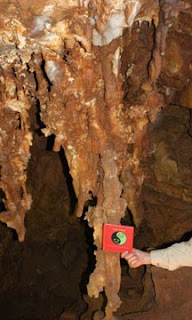 Very interesting cave and we were lucky that Frank wanted Fur Shui to have some great photos." 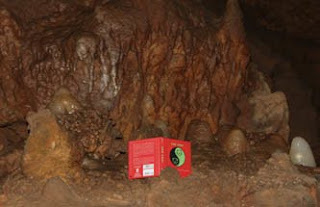 Go to: http://www.beautifulrushmorecave.com/ for info on caves! Rainy recently had a wonderful trip throughout some neat locations in the West, all around South Dakota and interesting spots in the wide open spaces of the West. Many thanks for taking Fur Shui along with you on your tour of fascinating places of discovery! The Tour de Fur wnet into caves under Mt. Rushmore, on archeological dig sites and into old ghost towns. 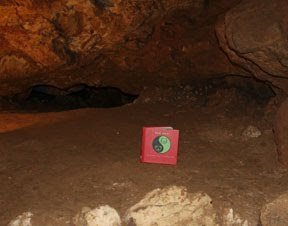 I learned a lot from these travels and was amazed at the locations the book was seen...going into cave locations where tours rarely are taken...red is the color of energy and activity, and the fame qua's element is fire...and there was a lot of energy and firey exploration on this trip!!! Have fun looking at where Rainy traveled with the book as well as her tips for website connections. 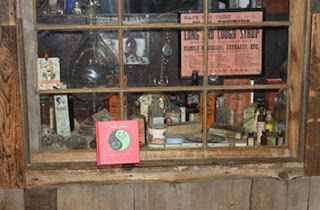 Here's a shot of the ghost town museum with Fur Shui riding "shot gun"! Start spreading the news, NYC! 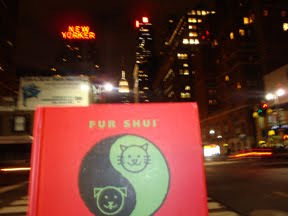 Fur Shui is out and about in the big apple after being checked out by Elaine's two fur folks. Hmmmm, looks like the kitties are a perfect match for the book! Just wondering if the two cats are the one's out on the town with the book or is it just their person? Having fun with Fur Shui! 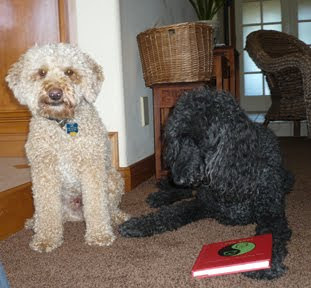 Lisa's two fur folks Katie (black) and Mojo certainly get their "mojo" going with Fur Shui! Looks like Katie wants to help out with the career life space...right at the front door where black is the color to amp up your and their life paths and jobs. Maybe their main job is greeting and guarding their person? What a team! 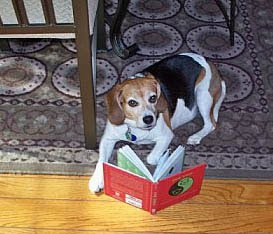 Linda's beagle Munchkin is certainly a fan of Fur Shui! Looks like Munchkin is enjoying the Family and Community gua...the element here is wood and the color is green (comfy carpet! ), and I know that this fur folk must come from a loving family. Here's what Linda had to say about the Tour: "I thought your book was very interesting and the concept of passing it along is ingenious. Thanks for the opportunity of letting me be a part of this wonderful idea of yours." Thanks Linda and Munchkin for being part of the tour!!! Anthony and David with Lucy (the blonde) and Lola (spotted) send greetings from NYC from their recent road trip from Deleware! It is lovely to be snuggled into a nice white couch...the color of children and creativity. For all the traveling, try a silver collar or leash or a nice warm and comfy gray tone travel crate or blanket. A big hello to the Big Apple from all! 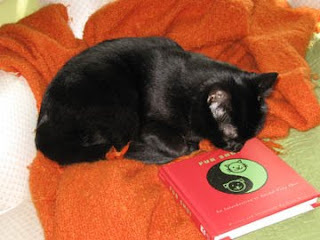 Karie's pretty black cat "Boo" is snuggling into Fur Shui with great pleasure. She sits and reads for hours (like her person!) at the window in deep bliss and reading quiet. Looks like her favorite gua is Fame...red is the color for this life section. Boo is a classic black Halloween cat, so her natural color amps up Karie's career gua no matter where Boo travels. 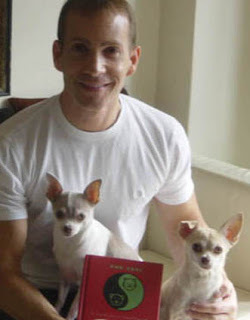 Thanks Boo for making my book "famous" in your home. 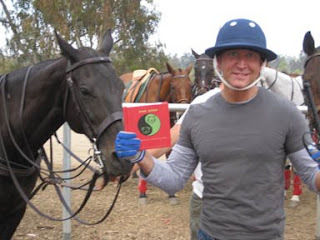 Last day for Polo in Del Mar, CA this past Sunday...great match! Look at all the polo ponies admiring Dennis and Fur Shui...His blue helmet and gloves will help with the learning of the game; blue being the color for "skills"! By next year Dennis will be enjoying playing the kingly sport of polo with greater skill and help from all his helpful fur folks.